Don’t miss any announcements, special offers, schedule changes or other Yoga Here & There news! Yoga Here & There is about yoga, here and there. Yoga Here & There’s founder, Yaisa Nio, is based in the Fleurieu Peninsula, South Australia, where she teaches weekly yoga classes and workshops. During the Australian winter months, she goes to warmer climates to conduct yoga teacher trainings and retreats. If you are looking for someone to coach you over a longer period of time for a specific health and happiness goal or general wellbeing, she is available all year long. Deepen your practice while you build the foundations to teach. 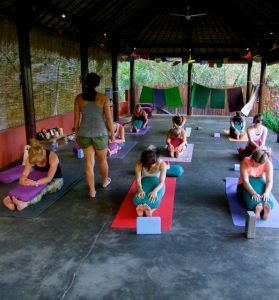 We currently offer 200-hour and 250-hour Yoga Alliance certified multistyle teacher trainings in Bali and Egypt. Train with experienced international teacher trainers, make friends for life and immerse yourself this life-changing experience. We invite you to find your balance in beautiful surroundings. Immerse yourself in yoga practice, meditation and workshops as well as delicious, nutritious food. 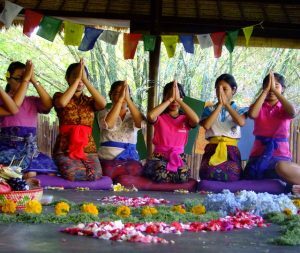 International experienced teachers guide you through a program of all things yoga and you will never want to leave again. So you have heard yoga is good for you. Perhaps you have heard yoga is only for flexible people. Or for hippies. Maybe for bored housewives. Indeed, it’s all of that and much more. Yoga is for everybody. And for every body. If you can breathe you can do yoga, in one form or another. How many diets, training schedules and friendly advices have you already you tried? How many books and articles have you been going through to find the answer? Let me tell you. There is no one solution for health and happiness. It is highly unlikely that you will succeed by copying someone else’s recipe for success. Personalised health coaching is the best way to help you find your unique balance. And I can let you in on a first secret already. Health is not just about food & diet. I coach you without calorie counting or step counting. Unless that is that you want. But I prefer to look at overall: health, emotional, intellectual, spiritual and physical. Become your healthiest self, with my support, guidance, knowledge and experience.